Webster defines 'Flashpoint' as being the lowest temperature at which vapors above a volatile combustible substance ignite in air when exposed to flame, or, a point at which someone or something bursts suddenly into action or being. When you see this beauty in bloom for the first time the explosion of color will stun you. 'Flashpoint' is best described as 'Star Gazer' on steroids! 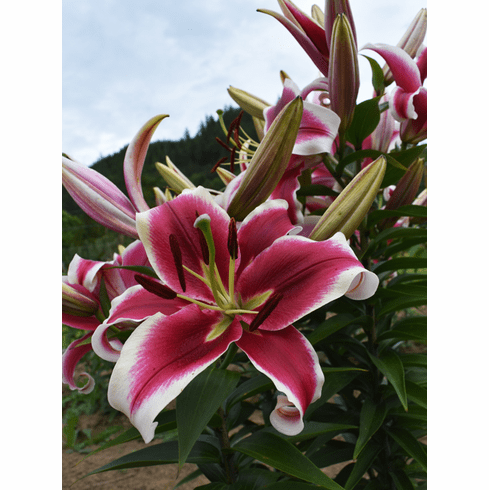 The blooms are robust red and cream with mostly outfacing flowers, (upper flowers usually face upwards) that just scream color with the opening of each new bud. You will be compelled to burst into the garden each day to marvel at the new display of color added to your experience of the day before. Super substance even for an Orienpet and great scent. In the propagation field they run 3 to 4 feet but settled bulbs in Dianna's garden top 5 feet. July Flowering. Fragrant. First insert photo shows 'Flashpoint' in bloom in cool weather where it will carry more red coloration. The 4th. inset photo is a row of 2 year old 'Flashpoint' coming into flower with 'Silk Road' in the background.